Whenever statists talk about either "fighting the deficit" or "following the Constitution" we know they are about to use these terms as weapons against America since they don't give a hoot for either in their normal course of doing their destructive anti-American business. And of course the preliminary injunction ruling by a federal judge that temporarily blocked some of the illegal immigration fighting provisions by Arizona police under The Support Our Law Enforcement and Safe Neighborhoods Act (introduced as Arizona Senate Bill 1070 & now simply known as Arizona SB 1070) is the latest example of statists pretending to find importance in following the Constitution. In both 2006 & 2007 illegal immigration was the hottest topic in our group in that we exchanged more messages on this issue than any other one. The problem is that illegal immigration is an emotional issue & not one that will sway most people to vote for one candidate over another unless of course you are an illegal yourself & favor bills & politicians who are trying to bring the rest of your family to America free of charge to you. This principle can only add to the degree to which the rest of us are already outnumbered. The other weapon that statists like to use on the illegal immigration issue is to question the practicality of deporting 12 million illegals. I always respond by saying let me see you deport one. As long as there is talk of not deporting any one there is nothing to fear, but I vividly recall the brilliant Heather Mac Donald of the Manhattan Institute explaining that thousands of Pakistanis self deported from NYC right after 9/11 & of course tens of thousands of illegals have left Arizona in the past few months @ just the threat of Arizona SB 1070 becoming law. Arizona Governor Jan Brewer has promised to take this matter to the Supreme Court if necessary so it will be around for quite some time. I refer all of you to ReturnToExcellence.net - under "Classics" on the left hand side of the blog click on the piece (third one from the top) I wrote on September 23, 2006 entitled "Immigration Laws & The Problems With Their Enforcement." Long time members will enjoy the refresher & first time readers will find it very instructive in preparing for what will be in the news for quite some time. The piece was based on an interview that Congressman Frelinghuysen arranged for Carol & me with ICE Special Agent Mark Kelly in Newark. To give you an idea of what we are facing the summary of the 2006 piece ends - "The # of illegals has increased to epic proportions in some parts of the country - there are 10,000 ICE agents & 12 million illegal aliens in America." Thanks to all of the people who sent me the link to the Hardball video of Chris Matthews' interview with Alabama congressional candidate & FairTax supporter Rick Barber - I didn't realize this many people watched MS-LSD. Matthews masterfully played to his statist audience by acting confused about current embedded taxes & seemingly could not understand that the FairTax is a replacement for all of the IRS enforced taxes - he kept describing the FairTax as an add on to state sales taxes as if this is not the case today with the income tax. Matthews' goal was to make a perfectly normal Tea Party candidate look like an extremist & in the process make the FairTax look extremist. What is extremist is that the income tax system is strangling our economic activity @ the expense of the citizenry to the benefit of a handful of socialist elites. The sooner people stop watching people like Matthews altogether the better so that we get them off the air. Anyone who has read these messages for any length of time can see through Matthews' charade & answer his questions themselves. 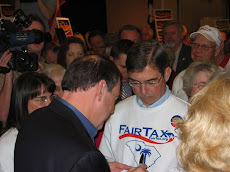 That is why this blog, TV programs like the national FairTax TV program on July 4, & educational seminars given in your neighborhood are so important so that people understand the truth about the FairTax so that they can withstand the purposely misleading lies presented by the enemies of America. Ken Hoagland writes from Houston after the initial ratings of yesterday's national TV program came in - "We'll be doing much more based on this great public response because—as you already know—when people know the details, they like the FairTax. Our biggest challenge is not convincing people this is a good idea but convincing people that the power of political insiders can be overcome. You and I both know that we have to roll over Congress, tax lobbyists and insiders who profit richly from the corruption of the income tax code. A lot of our fellow citizens just don't believe anymore that the Founding Father's promise of a nation, 'of, by and for the people…' can be achieved anymore. It is the worst kind of cancer on our system of self-determination. That's why it falls to us not just to tell more and more Americans about the potential of the FairTax but to be real leaders in restoring a kind of "citizen self-confidence" that makes our Constitution actually work." 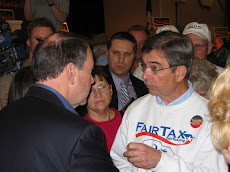 Pick your battles & I hope supporting the FairTax is one of them. The drumbeat continues by the most dedicated & committed people I have ever worked with - to give America & your family a chance to Return To Excellence.